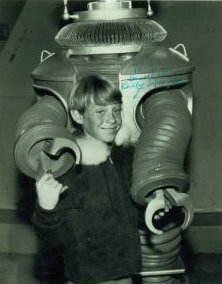 Found at an estate auction Will Robinson (Billy Mumy) and the Robot from Lost in Space 8" x 10" Black & White glossy photograph with signature in blue ink "To Jim Best Wishes Billy Mumy". 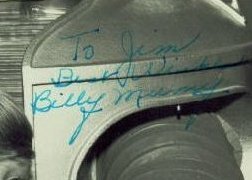 Includes the original envelope addressed to "Master Jim" -- return address as follows: Billy Mumy % Lost in Space Prod. 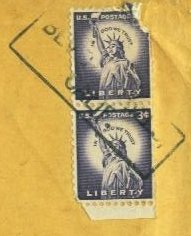 TWENTIETH CENTURY-FOX FILM CORPORATION BOX 900 BEVERLY HILLS, CALIFORIA Affixed are 2 Liberty 3 cent stamps cancelled with Beverly Hills, CALIF. The cast always wrote back to there fans, and sent autograph photos of them on the show. 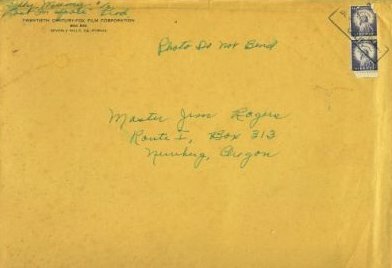 Actor Billy Mumy even addressed the envelope before mailing it. This is a very special item and very collectible for Lost in Space fans.